Farris Galyon worked to optimize Fort Bragg's cogeneration plant and furthered engagement efforts. US Army Garrison Fort Bragg enlisted Farris Galyon to assist the energy team with energy efficiency and conservation measures, in the form of equipment optimization and stakeholder engagement. Though Fort Bragg has a portfolio of energy efficiency projects implemented installation-wide, the cogeneration plant was identified as an opportunity for optimization analysis. Additionally, building occupant behavior was identified as a major opportunity for energy conservation, so Galyon was tasked with engaging occupants, for the purpose of inspiring behavior change. Galyon weighed the cogeneration plant kilowatt hour generation against the cost of running and maintaining it. 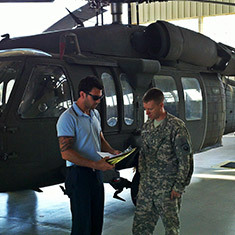 Additional considerations for this evaluation included the discounted real time pricing rates at which Fort Bragg procures energy, the seasonal demand fluctuations and the unquantifiable need for energy security (the capability for on-site generation in the event of a power disruption). Galyon also helped promote the Fort Bragg Energy Conservation Coordinator (ECC) training, as part of the implementation of the Fort Bragg Energy Council. Through robust stakeholder engagement, in the form of energy audits and group education, Galyon was able to identify and cultivate energy champions, who promoted conservation at their individual tenant commands. Through a weekly and monthly deliverable to the energy office, the energy team was able to maintain visibility over the conservation measures established at each building. Galyon recommended a portfolio of engagement solutions to include firmer audit tracking mechanisms and link occupant behavior to the occupant’s budget. Ultimately, Galyon determined that the cogeneration plant offered significant savings across a wide range of natural gas prices. Through his analysis, Galyon was able to identify potential annual energy cost savings of roughly $1.8 million given FY 12 natural gas prices. These savings could result in an overall reduction of over 12,000 metric tons of carbon emissions annually – over 240,000 metric tons over 20 years. When subject to a Life Cycle Cost Analysis, which includes financing and maintenance costs, real savings becomes more than $811,000 in annual savings and over $12 million in savings over a 20 year life cycle. Farris Galyon, a student at Presidio Graduate School, was hired as the 2014 EDF Climate Corps fellow at the US Army, Fort Bragg.